Of course I clicked through, and the result was remarkable. It’s a TWC story titled, “Boom: North America’s Explosive Oil-by-Rail Problem.” It features a video, whose opening image—a derailed oil train—is frozen across much of the screen. Because The Weather Channel evidently knows no subtlety, this video with its arresting still representation is only the foreground to an enormous, screen-wide background composed of a looping GIF depicting an oil train aflame at night. Tucked away at the very bottom of the page—you have to scroll down past yellow titles and pictures of derailed/burning trains for some time—there’s a breathless investigative report matching the attendant imagery in tone. All told, it was strange detour from the weather. One would think: ‘With a name like The Weather Channel, there’s not much room for non-weather topics.’ But you’d be wrong, alas. In addition to climate change, TWC’s purview extends all the way to…the safety of America’s energy infrastructure. Makes no sense to me. Sorry. 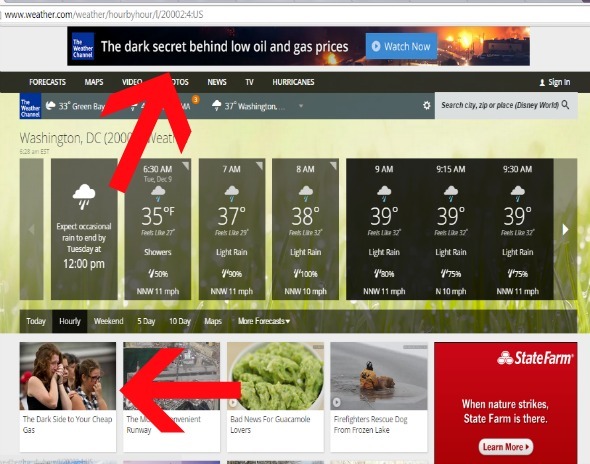 I had the opposite reaction to the story and video on the Weather Channel. I was glad to learn about the decrepid state of our rail system and the use of innappropriate tank cars for use in transporting explosive oil. Perhaps more Americans will realize that there is a price to pay for cheap gas. Perhaps we’ll realize that the destruction of our natural resources for a few more years of cheap oil through fracking is not in the best interests of the entire planet. I turned off WC over a year ago because of the horrific (in my opinion) non-weather related stories. Stick to just the weather WC and maybe I’ll come back.